Many gamblers may not be familiar with Sic Bo, a game trumped in popularity by more common games like roulette and blackjack, but it’s definitely worth getting to know. Popular in Macau, China and Atlantic City, it’s now common to find one Sic Bo table within the walls of a land based casino as more players fall in love with this easy to learn game of chance. Several leading online casinos now offer a version of Sic Bo and it can prove for some entertaining and potentially lucrative virtual betting. Sic Bo (otherwise known as Tai Sai or Dai Sui) is an ancient Chinese luck-based game that literally translates to ‘Dice Pair’. 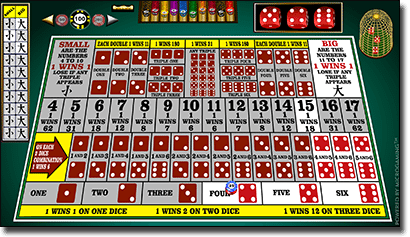 The game uses three dice and a corresponding betting table that displays a range of wager options. Players place bets on the outcome of the roll of the dice, with different payouts for different outcomes. The pay scales vary between casinos so players should always check the pay tables before committing to a game to avoid any disappointment. Sic Bo is affectionately referred to as ‘Chinese Roulette’ as it is similar to the roulette wheel in that bets are placed on hopeful numbers with the results left entirely up to fate. To play Sic Bo, players are required to place chips on the betting table as to what they think the outcome of the dice roll will be. Three dice are then rolled and the player wins money for any outcomes they correctly predicted. Small Bets – betting that the value of the sum of all three dice is between four and ten and none of the dice land the same number. Payout for a winning small bet is 1 to 1. Big Bets – betting that the value of the sum of all three dice is between 11 and 17 and none of the dice land the same number. Payout for a winning small bet is 1 to 1. Odds or Evens just like in roulette, you are betting that the total value of all three dice is either an even or odd number, with 50/50 chance of winning. Payout for a winning odds or evens bet is 1 to 1. Totals – betting on the exact number of the total sum of all three dice. The payouts vary hugely, with four and 17 typically paying the highest at 62 to 1, with 10 and 11 the lowest winning bets, paying 6 to 1. Single Number – betting on a single number showing up on any three of the dice, with higher payouts if more than one dice land on that number. Payouts are typically 1 to 1 if the number shows up once, 2 to 1 if the number shows up twice and 12 to 1 if the number shows up three times. Two of Three – betting that two of the three dice will land on a specific number (for example: betting that a five and a three will show up). Payout for a winning bet is 6 to 1. SpecificDoubles – betting on a specific number showing up on two of the dice (for example: two threes and a five). The payout for a winning double bet is 11 to 1. Specific Triples – betting on a specific number appearing on all three dice, (for example: three twos). The payout for a winning specific triple is 180 to 1. Any Triple – betting that all three dice will land on the same number, regardless of what that number is. The payout for a win is 31 to 1. The house edge in Sic Bo varies slightly depending on the pay scale of the game at hand. Based on the payouts mentioned here, the lowest house edge is for the small or big bet at 2.47% and the highest house edge is 16.20% for specific triples. Microgaming Sic Bo – this leading software provider plays homage to the authentic Asian inspired Sic Bo game, using the traditional red colour and Chinese symbols. Click on the chip in the bottom betting section to increase or decrease the amount of your wager, then click on your desired betting option to place a bet on that dice outcome. Hit the ‘roll’ button to commence play. There’s no auto-play option for those who like to speed through, but you can click ‘repeat’ to place the same bet over and over. Playtech Sic Bo – with a more sophisticated layout, Playtech’s Sic Bo certainly brings this ancient classic to the modern world. There’s not much difference to the Microgaming version, other than the design which favours green, but punters looking for speedy play may prefer customisable options like being able to disable the dice rolling animation to increase the speed of the game. NYX Gaming Sic Bo – this game kicks off with a nice little Flash intro to set the casino atmosphere and uses a crisp layout that’s easy to navigate, making it a breeze to play even if you’re new to the game. Unfortunately this version doesn’t offer an autoplay or re-bet feature so if time is of the essence, you may favour one of the aforementioned software options. This game can be difficult to find at our recommended casinos, but Royal Vegas Casino offers the ideal place to Sic Bo online. As more players look for bigger gaming variety we expect more casinos will start offering Sic Bo, but in the meantime RVC allows free play in demo mode and real money bets for new and experiences players to this time honoured casino game.